Natasha Tahane gives readers a peak into who she is. 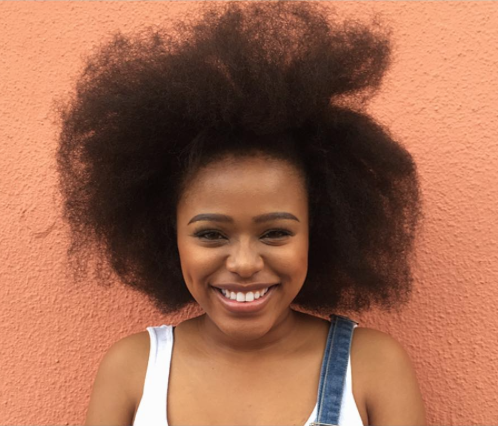 She is one of the youngest females in showbiz, and the talented Natasha Thahane (21) recently spoke to True Love Magazine about her ongoing journey to success and gave a sneak peek into who she is. Currently starring as Amo Maake on Mzansi Magic’s hit series The Queen , she has also starred in other shows such as Saints and Sinners, eKasi: Our Stories, Galz and Ses’Top La, and of course the show which put her on the map, Skeem Saam. The actress was born in Orlando East, Soweto and was raised by her grandmother, great grandmother and aunt and she believes their support is the one of the reasons behind who she is today. At the age of 16, while at Middleton High School in Cape Town, Thahane moved in with her grandfather, the South African civil rights activist, Archbishop Desmond Tutu. Like many celebrities, Thahane has experienced lots of criticism centered on the way she looks. “Where do I begin? I’m constantly called out for my knock-knees, ‘mkhaba’ (fat tummy) and skinny legs,” she told the magazine. One thing people didn’t know is that Thahane fell off a tree as a child, resulting in the way she stands. Based on the accusations about her being in a relationship with rapper A-Reece , she states that boyfriends take away too much time and that she wants to focus on her road to success. In 2013 she studied accounting at Wits University, but later dropped out to focus on furthering her acting career. The future is definitely bright for this young TV personality, and her fans can sit back and watch her continue to flourish.